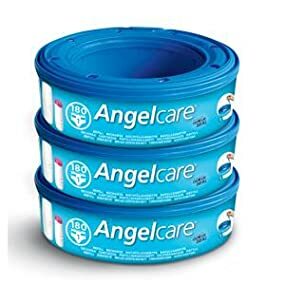 Important: These Angelcare refill cassettes are only suitable for the standard Angelcare nappy disposal system purchased in the UK or Ireland. Angelcare Refill Cassettes - 3 pack. The Angelcare Refill Cassettes help to provide a convenient and hygienic way of disposing of dirty nappies. Each Angelcare refill cassette includes multi-layered barrier film bags that offer a range of benefits over competitors. The Angelcare Refill Cassettes (UK) are only suitable for the Angelcare Nappy Disposal System purchased in the UK or Ireland. The multi-layer air sealed film in the cassette provides effective odour-barrier technology, for a more fragrant home. Nappies are wrapped individually, and the Angelcare nappy disposal system uses up to four times less plastic than other systems. All nappies in the nappy bin are safely contained and you won't have to touch or smell them again.